Foodmantra: Haven’t you also been wondering, how spicy is the New McSpicy? Haven’t you also been wondering, how spicy is the New McSpicy? From the first time you saw that McDonalds advert that has come out on TV and newspapers, haven’t you been waiting impatiently for that day when your friends will decide to pay a visit to McDonalds? Those yummy pictures of McSpicy Chicken and McSpicy Paneer in the daily newspaper, advertisements on big boards while you were driving, ads on the radio when you were in the of work and then again on television while you were waiting for dinner to be served. I had been seduced long enough. All my friends had tried it, some liked it, others said that there was something missing. My curiosity had reached its peak, I couldn’t hold myself back any longer, I thought, I must try it. 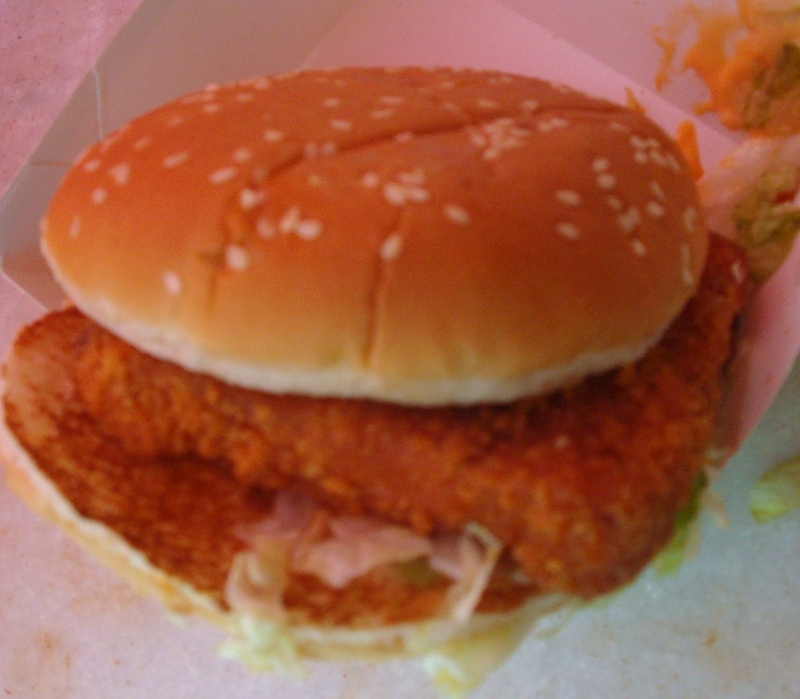 There was more than one reason for my curiosity about this burger, that crispy, fried chicken in the centre of the McSpicy looked very similar to a certain Mr. Z in the K fried factory. I really wanted to find out if Mr. McSpicy was actually the step-brother of Mr. Z with slight spicy oomph! factor. So, after a little shopping spree my mother, sister, I went to the Jangli Maharaj Road branch of Mcdonalds in Pune to sample the new ‘Mcspicy’. A word of advise, if you are so hungry that your stomach is making funny noises and you are hoping for something quick, think that McSpicy over. It took ages for them to prepare it. By the time they put it on my tray, my hair had started greying and I barely had any teeth left to chew. First, I tried the McSpicy chicken, I think this burger is a smart move by Mcdonalds, it will surely help their Coca Cola sale. Was it spicy like the ad on TV? Yes, it is very spicy, not in the first bite but as you take a few bites, the spice hits your throat and that is when that large Coke comes in handy. Is it like Mr. Z? In its flavour, it is not like Zinger, but it is really crispy and you can literally hear that crunch sound ringing in your ears. The inside has a boneless chunk moistened with a spicy sauce, this one is really sharp and pungent, the flavour was a little like those bottles of branded green chilli sauce yet different and, brown. There was light orange signature sauce of Mcdonalds in it with a slice of cheese. The surprising thing was, with all those sauces you would expect the burger to be moist, but the burger somehow just tasted very dry making that large coke necessary, like I said earlier, nice move by McDonalds. The spice factor was nice but the overall lack of a moist juicy feel in that burger disappointed me. Have you ever been really, really disappointed like that saying in Hindi goes, you dig a mountain to find a rat! Oh My! Some things do sound better in Hindi, ‘Khoda pahaad niklaa choohaa!’ Paneer McSpicy was that choohaa. I was hoping since it is paneer it won’t be as dry as the chicken burger but I was wrong. The Paneer McSpicy is a no, no. I would prefer the Mc Aloo Tikki or Mc Veggie over the McSpicy Paneer. It wasn’t crispy, it was really spicy but there was no distinct unique flavour, all I could taste was the sharp, pungent yet bland paneer on my tongue. It was just a thick slice of Paneer which was fried until it was NOT crispy, the slice of paneer was not juicy, it tasted bland and yet, afterwards the spice hits your throat. There was nothing great about this burger, it was very disappointing, unless you are crazy about paneer, and even if you are, it is easy to find far better Paneer options around town. 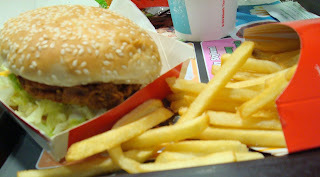 If you are really bored of eating the McChicken or McGrill, Chicken McSpicy is worth trying as long as you remember to get that large Coke. Paneer McSpicy, I will not recommend it, I suggest stick to your old favourites Mc Aloo Tikki and McVeggie because this vegetarian step-brother of Mr. Z is just not worth it. liked your blog! I have forwarded to my daughter in UK...she is into cooking , after marraige! Good luck to you. I am your Mom's Rotary friend, Alka. I hope your daughter and you will enjoy reading the Blog.